The homeowner initially had two decks that didn’t relate to one another, so Biedenweg built two separate spaces; a screened porch as a bug-free zone and a new deck for open-air entertaining. It’s easy to move from one to another. The screened porch at this home was existing. 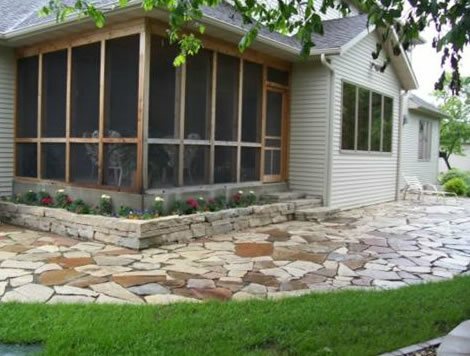 Usually, builders or remodelers do screened porches, not landscapers, because you need architectural plans and permits to do construction on the home. The interior view of this screened porch shows heavy beams and rafters strong enough to support the snow load. The railing has a Dekorator baluster, and the decking material is ipe, a Brazilian hardwood which has been oiled. 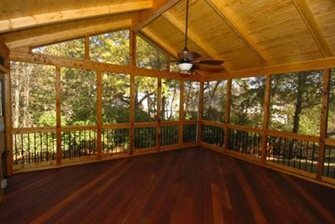 This screened porch also has open deck space on either side which can be used for grilling and other activities that aren't possible under a solid roof. Terry points out that some styles of home are better-suited to a screened porch than others. “Some architectural styles are meant to be flat-fronted,” she says. 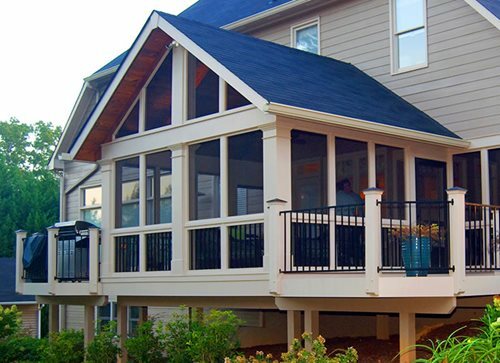 “If the architecture is balanced and symmetrical, or is of historic importance, I wouldn’t suggest a screened porch.” However, other types of architecture have generous proportions that work well with a screened porch, such as Craftsman or Queen Anne homes. 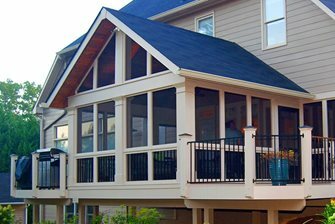 A screened porch is similar to a sunroom in that it’s built directly onto the house, has a solid roof, and should be styled to harmonize with the existing architecture. Yet sunrooms have windows and are often insulated, while a screened porch is an open-air structure built to provide comfortable shade and protection from bugs. When to choose a screened porchScreened porches are best in areas where you’d like an enclosed shade cover next to the house, yet don’t want to deal with wasps and flying insects spoiling your hangout. They’re particularly nice if you regularly get home from work at dusk and want to spend time outdoors during prime mosquito hours. However, a screened porch is not the best choice if you’re hoping to sit outside in winter, because the solid roof is the only protection you get from the elements. Design options“The porch is a link between the landscape and the home,” says Alison Terry, a landscape architect in Fullerton, CA. “So it sets the mood for your whole experience of the home,” she says. Screened porches will typically have some outdoor design elements, and some that relate to the home, so it shares attributes with both home and landscape. Here are a few elements to consider in the design process. A screened porch doesn’t have much protection from moisture or the elements, so flooring needs to be suited to the outdoors. “We typically use decking as the floor, though it could be pavers or stamped concrete,” says Baron Biedenweg from Archadeck of Fort Wayne, IN. 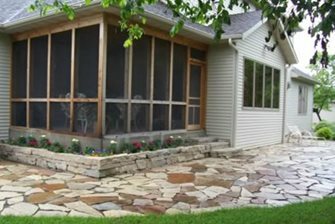 Because the rain can blow into the screened porch, a material that drains or allows evaporation is wise. Biedenweg advises that you match the shingles and roof to that of your home, so the porch and home feel integrated. “Think about what you want the interior trim to be,” says Biedenweg. “Rustic and outdoorsy, or should it match the siding on the house?” he asks. Of course, if you’re certain you never want to turn your screened porch into a sunroom, you can get away with using much larger openings for the screened areas, because you don’t have to pay attention to what standard window sizes are available. Either way, it’s good to have that discussion with your contractor and try to anticipate your future plans. 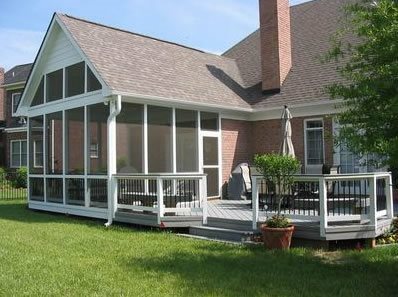 Cost of a screened porchBecause a screened porch has a solid roof, walls, outdoor flooring, and shares design elements with the house, it’s definitely more involved than your average open-roof pergola set within the landscape. “The cost depends on the square footage and level of trim,” says Biedenweg. 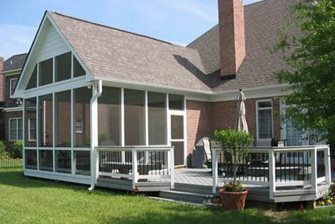 The cost for a screened porch ranges from $12,000-25,000, with the average project coming in at about $15,000.